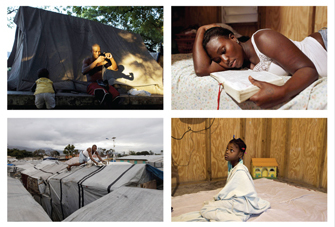 This combination photo shows people displaced by the 2010 earthquake in Portau- Prince, Haiti. Two years afterwards, more than half a million Haitians are still homeless, and many who have homes are worse off than before the powerful quake, as recovery bogs down under a political leadership that has been preoccupied with elections and their messy aftermath. (FinalCall.com) - “Occupy” Haiti? Activists argue this is exactly what the U.S., UN and thousands of non-governmental organizations (NGOs) are doing in the world’s first independent Black republic after a devastating earthquake shook this Caribbean nation two years ago. So-called great liberators under the guise of humanitarian aid and rebuilding have become entrenched, calling the shots while the masses of Haitians continue suffering. Rubble-lined streets, families wallowing in tent cities, cholera, and lack of fresh water is as big a problem today as it was in the immediate aftermath of the 7.0 magnitude quake that decimated Port-au-Prince and other areas of the country, Jan. 10, 2010. Two years later, nothing has changed, said some activists, in describing the lot of the average Haitian. The same questions raised one year later are still being asked two years later. What happened to the money? 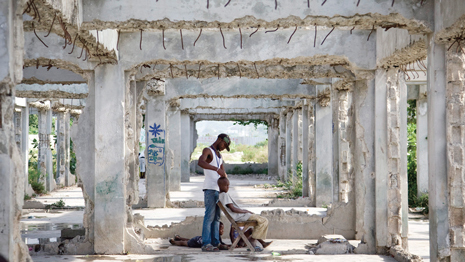 Who is profiting from Haiti’s misery? Are UN peacekeeping troops really peace breakers? Unanswered questions and continued interference by a foreign presence in their homeland have frustrated and angered Haitian activists. Haiti has been forgotten, they said. Does anybody really care they ask? “Nobody cares,” Ezili Danto of the Haitian Lawyers Leadership Network told The Final Call. Ms. Danto has stopped granting interviews because most media outlets are asking her about the two-year anniversary of the earthquake but neglect to ask about Haiti any other time. “Instead, half-a-million Haitians—500,000—have been infected with UN-cholera and 7,000 Haitians are dead from the UN/US/international ‘help’ that brought the most virulent strain of the cholera bacteria into Haiti,” wrote Ms. Danto on www.ezilidanto.com. However, the Haitian people are strong, resilient and will not be deterred by current obstacles, she added. “Not deterred that this newly US-hobbled-Haiti is now the ‘hot’ place for the super-rich, the wannabe humanitarians, their adrenaline-addicted celebrities, adventurers and the paid-to-lose-progressives to setup shop, take on their right wing counterparts with a hustler’s wink and for the Kim Kardashian ilks to come for spa treatments and acquire exotic ‘tribal crafts,’ ” added Ms. Danto. 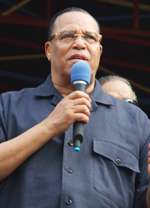 The Honorable Minister Louis Farrakhan, a son of the Caribbean, said recently many do not want to see Haiti rise up and become independent and self-reliant. In the Muslim leader’s historic first trip to Haiti in December, he delivered a powerful and timely message to the Haitian people. Min. Farrakhan reminded listeners at an outdoor rally of the great legacy of Haitian heroes Makandal, Boukman and Jean Jacque Dessalines that led to the overthrow of their French colonial slave masters and independence Jan. 1, 1804. “The reason you suffer is because the enemy knows that what you did in 1804 can be done again. So, from France, from England, from America: No matter what they say, they do not want to see Haiti rise again,” said Min. Farrakhan, whose words were translated into kreyol as he spoke Dec. 14 from a stage in downtown Port-Au-Prince. In the background was the still destroyed National Palace and a tent city that is home to displaced Haitians. Money pledged, money spent, where? “The only thing I can tell you is the same thing everybody else has been telling you which is the same: There’s still no work being done in Haiti. Relief money in Port-au-Prince has not reached the Haitian people at all,” Carmella Coqmard Muhammad told The Final Call. Ms. Muhammad’s parents are from Haiti. She still has relatives in the capital Port-au-Prince and Cap Hatien in the North. The Haitian people are “absolutely frustrated,” said Ms. Muhammad. Worldwide sympathy was accompanied by billions of dollars raised by various charities and groups in the immediate aftermath of the earthquake. According to the UN, $4.6 billion has been spent on relief efforts. But that is about half of the money pledged to help Haiti recover and rebuild. Yet little if any progress that directly impacts and improves the lives of the people is being seen. Only about half of the earthquake rubble has been removed. According to the Associated Press, only four of the 10 largest projects funded by international donors have broken ground. Nicole Lee, president of TransAfrica, told The Final Call transparency and accountability for where the money has gone is still needed. TransAfrica, along with several other groups in a Jan. 11 press release, called for immediate changes to recovery efforts to ensure that critical human rights concerns are addressed in Haiti. Representatives from TransAfrica, the Institute for Justice & Democracy in Haiti, Film at 11, Let Haiti Live and the Center for Constitutional Rights made recommendations including making non-profits more accountable for the money received.“Too many people have been left behind and too much money (has) been wasted to continue with business as usual,” said the group. Haiti has often been dubbed, “The Republic of NGOs.” Reports vary on exactly how many of these groups function there. Conservative estimates say at least 3,000, but some argue the number could be upwards to 10,000. These organizations have been in Haiti for decades. Ms. Muhammad said most of the frustration and anger of Haitians is directed toward the non-profits and charities. “These organizations promise a lot and give nothing. I can’t say it is the government itself that they are disappointed with because he (President Michel Martelly) just got there. For them, they don’t expect anything from him. They don’t look to the government for help,” said Ms. Muhammad. Over half a million Haitians are still living in nearly 800 tent camps and political log-jams between President Martelly and the Haitian parliament have caused some problems. After rejecting Mr. Martelly’s initial two choices for prime minister, parliament finally approved Dr. Garry Conille, an aide under the administration of former U.S. President Bill Clinton. Mr. Clinton now serves as the UN special envoy to Haiti. Some view this as further evidence of U.S. meddling in the affairs of Haiti. “It is clear that in Haiti today there is a shadow government, with the presence of former U.S. President Bill Clinton in the National Palace and at the head of a so-called ‘Presidential Advisory Council for Economic Development and Investment.’ It is no secret to informed people that the invisible hand of Bill Clinton is in the appointment of Garry Conille,” wrote Yves Pierre-Louis in article in Haiti Liberté prior to Mr. Conille’s confirmation. “What’s more, Conille directed Clinton’s offices as co-chair of the Interim Commission for the Reconstruction of Haiti (IHRC) and Special Envoy of U.N. Secretary-General Ban Ki-Moon. To impose Garry Conille as Prime Minister, all the country’s laws will have to be violated in the interests of the imperialist powers and the big, local predators,” continued Yves Pierre-Louis. “It is a common misconception, both in Haiti and abroad, that the country’s president holds executive power. In fact, his main power is to nominate the man or woman who does: the Prime Minister,” wrote Kim Ives in a separate article for Haiti Liberté. The non-profits use Haiti as a way to make money, said Ms. Muhammad. While traveling with a delegation from the Nation of Islam last August, Ms. Muhammad said the group witnessed a construction project while en route to a city in the mountains. “We saw a prison being built that will facilitate children from around the age of six I was told, seven and eight. How are you going to put a six-year-old in prison? Who was building that prison? The Clinton Foundation,” said Ms. Muhammad. Critics argue that the thousands of non-profits over the course of years have made it nearly impossible for the Haitian government to provide services for its people. These groups get more funding and have greater capacity than the government. The funding often comes from the United States, the United Nations and other countries and major international agencies. This is becoming more evident after the 2010 earthquake. According to a 2010 brief by the United States Institute of Peace, the Haitian government has had little chance to develop the human or institutional capacity to deliver services. “The Haitian people have learned to look to NGOs, rather than the government, for provision of essential services,” said the brief. Mr. Clinton helped broker a $45 million deal between Marriott and Digicel to build a 174-room hotel which is supposed to create 175 jobs. But meanwhile hundreds of tent cities remain. The thing with the Haitian people is, everybody has taken from them, said Ms. Muhammad “They use Haiti as a way to make money,” she said. Patrick Muhammad, of Phoenix, Ariz., was born in New York to Haitian parents. He moved back to Haiti as a toddler with his mother, where he was raised until age 15, when he returned to the States. Mr. Muhammad also has family still in Port-au-Prince and said according to an aunt, there are reports of Haitian children orphaned by the earthquake being removed and “adopted out” to other countries. While also traveling with the Nation of Islam delegation last August, Mr. Muhammad spoke with those displaced by the tragedy. They told him non-profit staffers, coming to “help,” often ate delicious meals but threw away the remainder—sharing nothing with people in need. The United Nations Stabilization Mission in Haiti (MINUSTAH) was set up by the UN Security Council in 2004 to “ensure a secure and stable environment” and “support the then Transitional Government.” Eight years later over 12,400 uniformed personnel make up MINUSTAH in Haiti. UN troops have been accused of a plethora of outrageous acts, including sexual assaults of men, women and children, murdering innocent civilians and looting. When cell phone was video released last summer of troops from Uruguay allegedly sexually assaulting 18-year-old Johnny Jean on a MINUSTAH base was circulated, outrage followed. There have been increased calls by Haitians for the UN forces to leave. “There is a history of sexual abuse by these so-called ‘peacekeepers.’ There is outrage that these soldiers brought the deadly cholera epidemic, which has killed more than 6,000 Haitians and sickened hundreds of thousands,” said an article written by G. Dunkel posted on the website for International Action Center, founded by former U.S. attorney general Ramsey Clark. The Final Call was referred to Vannina Maestraccia, associate spokesperson for UN Secretary-General Ban Ki-Moon, for comment. Ms. Maestraccia forwarded this writer’s questions to Silvie van den Wildenberg, spokesperson for the MINUSTAH. She did not respond. Ms. Muhammad said she finds it difficult to reach out to all of her family still in Haiti because there is so much need. “When people are in that kind of condition reaching out to them is not enough, just to say ‘hello.’ You have to have some kind of avenue, some venue for them. Some kind of help,” she said. “It’s almost like if you don’t have anything to help them with, reaching out to them is just a constant reminder that you’re doing better and they’re not,” she added. The spirit among Haitians is one of self-reliance and self-sufficiency, said Ms. Muhammad. Haitians look to Haitians in the Diaspora to come back and help rebuild and provide assistance, Ms. Muhammad continued. She is working along with her family for one of her cousins to relocate from Port-au-Prince to the U.S. so he can attend college. 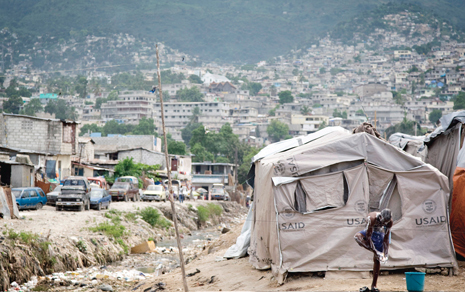 “With people in Haiti, it’s ‘life goes on.’ They’re used to not getting any aid anyway. The majority of the sentiments of Haitian people is ‘ede tèt ou,’ meaning help yourself. The only person that is going to liberate Haiti and bring democracy to Haiti is the Haitian people,” Ms. Muhammad added. Ms. Danto expressed her thanks to the Nation of Islam and Min. Farrakhan for purchasing a $150,000 Mobile Max Pure solar water purification system delivered to Haiti in August by the delegation from the United States. The system was placed in a community of voodoo practitioners. Min. Farrakhan has promised two more systems, one for the Christian community, and another for the Muslim community. Dr. Ron Daniels, president of the Institute of the Black World 21st Century and founder of the Haiti Support Project, is leading a delegation of 38 Black and Haitian Americans to Haiti, Jan. 17-21, to further assess the progress of recovery and reconstruction. The group will also “explore ways to engage people of African descent from the U.S. in the process of building the new Haiti. “As we have observed repeatedly, people of African descent everywhere owe a special debt to Haiti for waging and winning a revolution which became a beacon of hope for Africans at the height of the holocaust of enslavement,” said Dr. Daniels in a Jan. 15 statement. Mr. Muhammad said the Minister’s visit to Haiti had a deep and profound impact on friends and family that he spoke to. At a Dec. 14 downtown rally in Port-au-Prince, Min. Farrakhan told the Haitian people he felt their pain but assured them they were living at the end of White supremacy. “Soon Haiti will be free! Soon, and very soon, the enemy will be removed from power not only over your lives here, but he will be removed from power over the people of our planet! So what is your and my responsibility in an hour like this? Ayiti (Haiti) Toma!—This is your land! Everything under this land is your rightful possession!” said Min. Farrakhan.